Flat backing for hard floors. Office chairs are important for most people who work in front of a computer all day. However, a few issues can come up, if the flooring is made from a hard material the chairs can move around too easily and could cause damage to the floor. 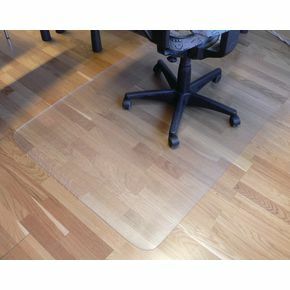 Our chair mats for hard floors will help prevent the chair from sliding around and prevents the wheels from causing damage to the floors. They are lipped to prevent 'fall off' and are made from durable polyester terephthalate construction so you can be confident that they have a long life span. These mats are available in three sizes; 900mm x 1200mm, 1200mm x 1500mm or 1200mm x 2000mm, so you can find the right sized mat to suit your requirements. Our chair mats for hard floors will enable you and your employees to work comfortably without worrying about sliding around unexpectedly on hard flooring.